Maybe the most wanted (but still not available) number will be the prim cost of a particular mesh. This number will decide at the end if a mesh is well done for our online world (saleable, practicable) or not. So we will need to talk a lot about various possible “optimization possibilities” to get our work into a good “shape”. Right now we have only a vague measurement about how good our optimization is, but as soon as the final prim costs are fixed i will update this article and adjust it to the numbers. Until then the methods introduced here are meant as just experimental. 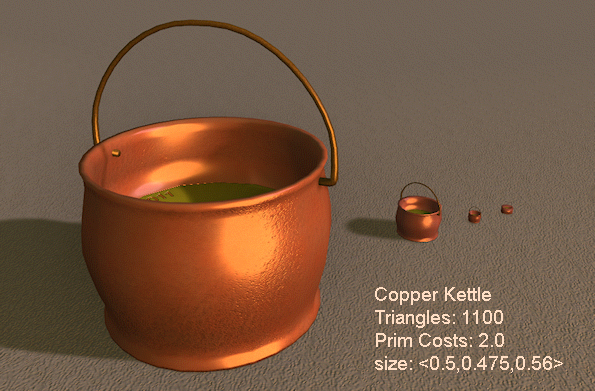 The kettle has 1024 faces (sculptmap size = 64*64 pixels) and the handle has 256 faces (sculptmap size = 16*64 pixels). The LOD is reasonably OK and the Primcost of this kettle is just 2 (for 2 sculpties). 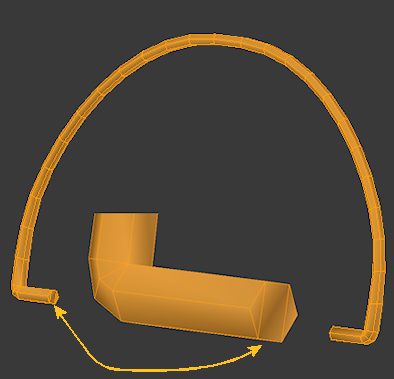 Make a similar kettle with a mesh and with the same or even less prim costs! Let us start clever. the kettle above and the handle are sculpties. But sculpties are meshes too, they just come along with some special constraints… Well, let us just try what happens when we take these 2 sculpties and “meshify” them . Actually all i do for now is exporting the kettle and its handle as a Collada file. Auto Generate has another option “Error threshhold”. But as far as i understand it is just another scale that you can use instead of the triangle count. The effect on the texture seems to be the same. Build Operator, Queue Mode and Border Mode are explained briefly in the Mesh Import test page on the SL wiki. It may be worthwhile to get deeper into that later. You should take care to tweek the LOD settings such that the number of vertices is reduced roughly by a factor of 4 for each LOD level. That seems to give you the least Prim costs. Later we will see that adding a Physics shape may also affect the prim costs. Exact values are currently not determinable. I will add more about prim costs when this data is available. But this is still not very convenient result. So we will try next to make our own LOD versions. Ok, I “cheated” a bit. When you look at the lowest LOD0, you see that i made it slightly better than the original LOD0 level. I kept 8 faces around the circumference while the sculpty LOD0 only has 6 faces along the circumference. But hold on! Fact I: You can optimize the LOD behaviour to your needs. You can decide if you want to have LOD at all. 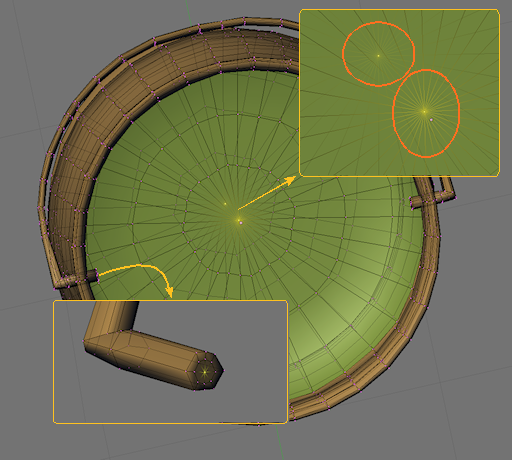 Or you can decide to make very radical LOD settings. You can do all of that with meshes. With sculpties you are bound to the automatic LOD calculations… But beware, this new freedom has a price, see further down! 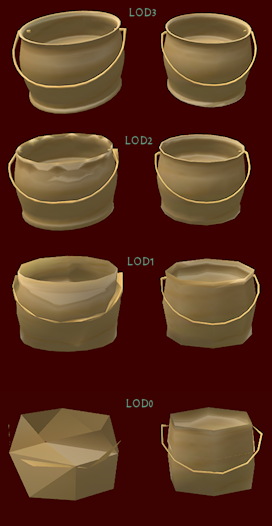 For now let us procced and upload and examine how our mesh object changed after we defined the differnt LOD’s as described above. So we may expect to see a slightly better LOD when going really far away. We will later see that there is still much room for optimization here. But let us do one step after the other. So apparently we can make meshes as good as sculpties. But why would we want to do this ? Why not just keep with the sculpty and be happy ? And can we get even better with mesh than with Sculpties (yes we can, see fact I above)? And … what about the costs of this mesh compared to the costs of the Sculpty ? This smells a bit like “maybe we have overlooked something…” And yes! We need to know about one very important detail, namely the physics properties of our object. We did not specify any physics properties and this (currently) causes the importer to silently use a very detailed physical definition of the object. That means, your object will react on physical interactions (for example bouncing into it, walking over it… And here we have the cause of the high primcosts. Having a very detailed and acurate physics shape will cause the physics engine on the server to do an awfull lot of calculations to determine if another object bounced on our mesh.The more acurate we define the physics boundaries of our object the more reaöistic it will react. Fact II: You can optimize the physics shape to your needs. You can specify how acurate the physics engine shall handle your object. visual model for the physics model. The less complex we choose the physicsl model, the less it will cost to rezz it. The leftmost shape is what the mesh importer calculated from the LOD3 shape of the mesh. 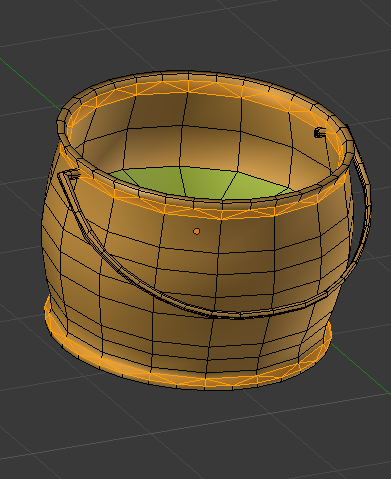 Note that the dip in the kettle has been closed and Actually what you will get is a very primitive physical shape (a convex hull) which has no holes in it but roughly follows the outlines of your object.. Having convex shapes makes object-object collision calculations very easy. Now we have mesh. And many constraints of Sculpted Prims no longer apply. For example the number of faces is no longer limitted. Fact III: You can use as many or as few faces as you need. Now we are at the end of Sculpted prims. Here is where we eventually enter the wonderfull world of Meshes. 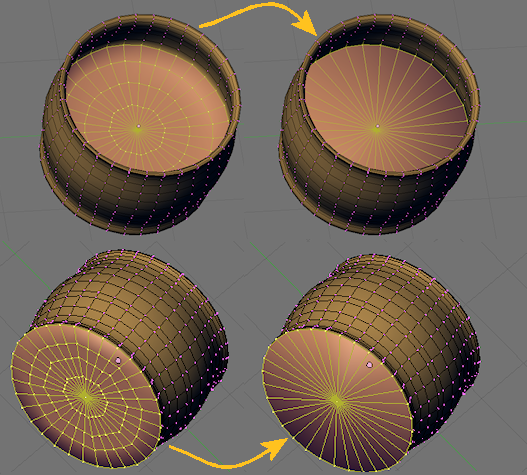 We already have touched a few exciting differences between Sculpted Prims and meshes (see Fact I,II,III above). Now we have to go deeper into detail. The challenge is to keep the look of the kettle as good as possible (or maybe even make it better if that can be done) but at the same time reduce the number of faces as much as possible. Here we will find a lot of play ground and a lot to learn about 3D modelling. let us begin… NOW! First let us get rid of the most annoying issue with Sculpted Prims. The poles! We do not need them any longer. 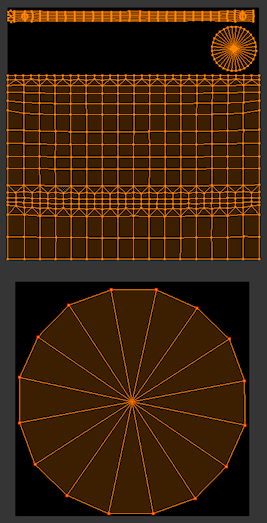 We can remove them by removing all duplicated vertices on the mesh. Fact IV: Collapsed vertices are mostly unwanted! You can remove the poles on your objects. how sculpted prims have to be constructed. And rember what a mess you get when texturizing around poles ? Here we saved 8 faces and another 8 faces on the other side of the handle. Fact V: Adding edge loops for LOD is not needed! in the next lower LOD. 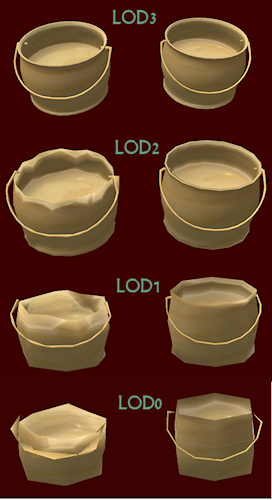 highly specialised and optimized LOD meshes as we need! e.g. when you want to combine sharp edges with smooth faces. Fact VI: You can define your own face desnity. You define where you want more faces. Or can remove faces which are not needed for the model. Fact VII: You can place vertices with high precision. of vertices. Now high precision is built in meshes and does not need extra effort. how to construct the handle from scratch and get even better quality. We also can get rid of a couple of edge loops on the kettle. Those loops are there only because the Sculpted Prim needed them to ensure good LOD behaviour. But since we can define the LOD behaviour now exactly as needed, we can delete many face loops now without getting any degradation in the visual look on any LOD level. Just removing the obsolete edge loops from the inner part and from the bottom of the kettle reduced the object from 1280 faces to 888 faces.So: Without much effort we can reduce the face count on LOD3 significantly! So our kettle now contains about 900 faces. But let us try to get further down with the face count without loosing shape. While we can remove the edge loops from the large flat surfaces without getting visual problems, this is not true for the vertical edge loops. We will loose a lot of smoothness particularly at the edges. But i will use a trick here. Until now we have only worked with rectangular faces (Quads). You will see in a moment where we now will need some triangles. The handle still looks a bit unpleasant and we will later want to make this better. So we will now reduce the vertical loops, but we will keep the top edge and lower edge untouched. In the image to the left i have marked all loops which i want to cut away. Please take an extra look at the ends of the loops after the loops have been cut away (next image). I have highlighted the edges where i have introduced triangles. this sort of optimizations could not be made with sculpted prims, but with meshes nobody can keep us from using triangles to increase face density where we want and to decrease it where we do not need as many edges.We are now down at 700 faces which is a reduction of roughly 45 %. And still the kettle shape has not significantly degraded.Let us now take another look at the handle. I want the handle to remain smooth. So i need a lot of faces to keep it smooth. But i still can save a few. The handle now is made of 8 faces around its circumference. I think we can live well with only 6 faces.Since the handle is already a bit distorted, let us just remodel it right in place. I started with a cylinder with 12 faces along its longitudinal axis and 6 faces around its circumference. 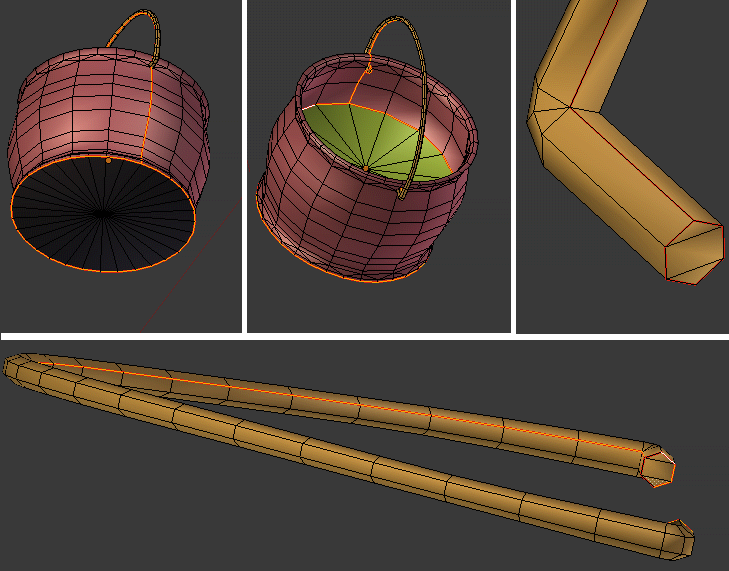 Finally i copied the entire mesh, mirrored it and stitched it together to create the entire handle. See that i only used 3 faces on the end cap of the handle. And since our final kettle shall be placed above a fireplace, we will readjust the handle to go straight upwords. The material settings will now become relevant. Fact VIII: You can have up to 8 texture faces with meshes. Remember that for your Sculpted Prim kettle you had exactly one texture face ? Our mesh kettle has 4 texture faces! And it could have up to 8 texture faces if we needed them. Remember for one moment our very first try. 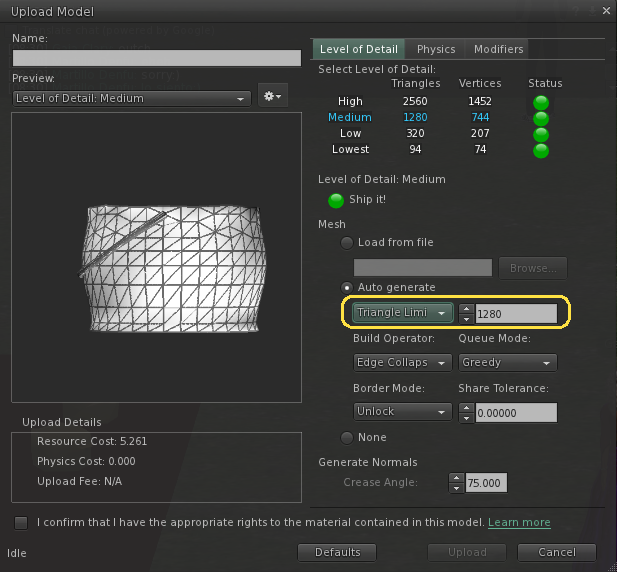 We can take our mesh and simply let the LOD-meshes be generated automatically. That may or may not lead to acceptable results. 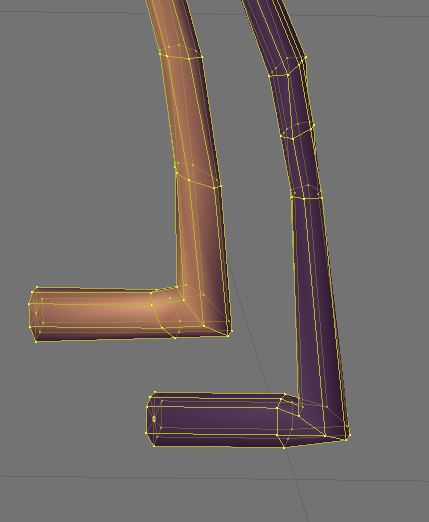 In all my attempts to generate some reasonable and cost efficient LOD i failed so far. Maybe it is worthwhile to examine the LOD-generator in more detail. But this is another story. So let us concentrate now on how to reduce our mesh. Radical LOD reduction: The reduction for each LOD should be as radical as ever possible. A very good rule of thumb is to reduce by a factor of 4 for each subsequent level. So we should aim to only see about 280 triangles on LOD2, 70 triangles on LOD1 and 18 triangles on LOD0. Now we have already reduced LOD3 quite a bit, so it will become very hard to achieve those numbers and we will not be able to get there without reducing the visual experience. However in this tutorial i will not go to the limits and i will keep the LOD reductions moderate. This works quite well because the kettle is only a small object and small objects are not very expensive. Number of Material settings: We have to take care that the material settings of the kettle remain intact in all LOD shapes. That means: each material i have used on the LOD3 mesh must(!) also appear somewhere on the lower LOD meshes. This is an unbreakable rule and it will be tested by the uploader. So for example if you wanted to remove the handle of the kettle in LOD0, then the importer will complain about incompatible texture face count. The only way to get out of this is to keep at least one triangle assigned to the texture face in question. You can hide this triangle somewhere and/or make it very small, if it does not add to the visiual epxperience. UV-Unwapping: We have to take care about UV-unwrapping. 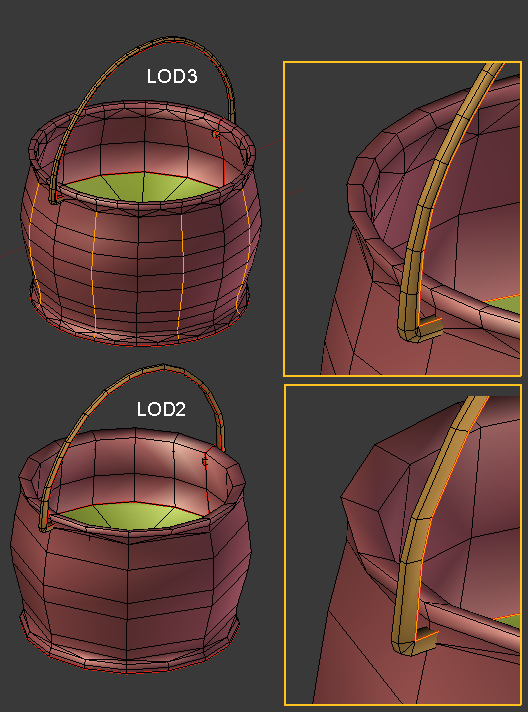 It is evident to know that the UV-map used on the LOD3 mesh will be reused on all subsequent LOD levels. And that means, whatever UV-map you used for the LOD3, you have to take care,that the subsequent LOD meshes can be texturized with the same UV-map. That may sound complicated first, but (at least with Blender) it is not a big problem to get compatible UV-maps as long as the meshes look roughly similar. But since that is actually what we want, we problably are on the safe side here. However note that you are not obliged to use the same shapes for all LOD meshes. So you could make some creative usage of objects changing their shape with distance. But that is also another story and will not be covered here in detail. Seams are very helpfull for UV-unwrapping. In fact when we try to unwrap the kettle without defining seams, we end up in a complete mess. 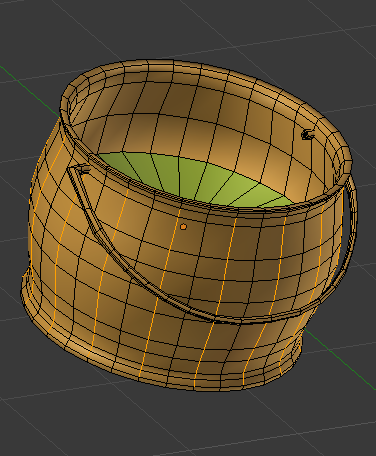 If you look where i have actually set the seams you may instantly get an idea how to use them for your own objects. We have used 4 materials on our kettle. 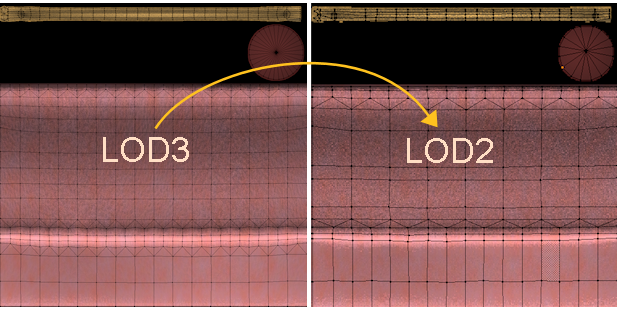 Defining seams makes it easy to keep the different material areas visible during our LOD reduction activities. Remember that the sculpted Prim has only one seam which would run from the center of the kettle bottom to the center of the kettle interior ? With meshes you have the full freedom to define your own UV-map. exactly as you want and according to the shape itself. On the downside, you must know how to make good unwraps. Please note that i have added one seam which runs vertically through the kettle body. This seam is needed to keep the UV unwrapper from doing weird things. You can try what happens without that seam and compare to the results i will show you in a moment. Also note that i have added 2 extra seams at the end caps of the handle. This is again only done to give a good hint to the unwrapper tool. The remaining 2 seams along the kettle bottom and along the kettle interior are mostly needed to mark where we have to take care on the different LOD levels. But they also help the UV-unwrapper to make a nice and easy texturizable UV-map for us. After we have marked the seams, we should now unwrap the mesh. This is not relaly needed at this moment for making the LOD meshes, but it is a good idea to create the UV map now and see if the unwrap is god, or maybe we ned to tune the kettle mesh itself to get better results and avoid possible problems. Maybe we also need to add more seams. On the left side upper part we see the handle. The small circle in the upper right is actually the kettle bottom. will not contain high detailed textures. 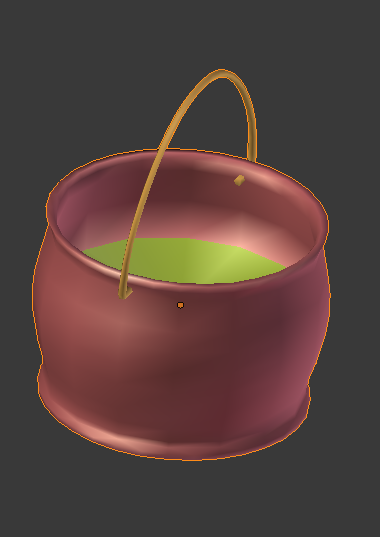 The next part of the left UV-map contains the kettle body. So most of the texture is reserved for the outer circumference of the kettle. There is a secnd UV-map on the botton left. this is reserved for the kettle interior. I slightly rearranged the map for the kettle body so that it is now perfectly rectangular. so that i can reuse the texture of the LOD3-map (this one here) with very little effort. 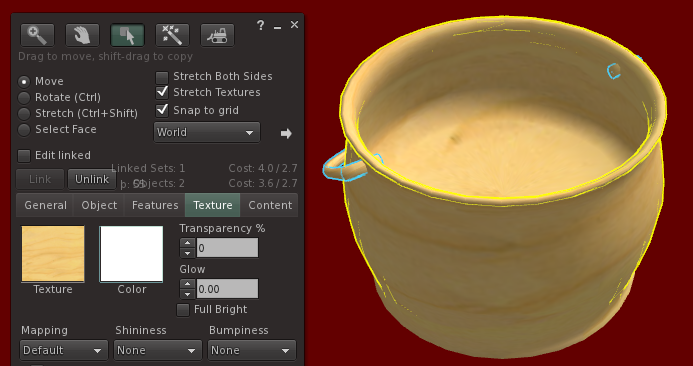 I will later reuse this texture as my guide for the UV-unwraps of the lower LOD meshes. 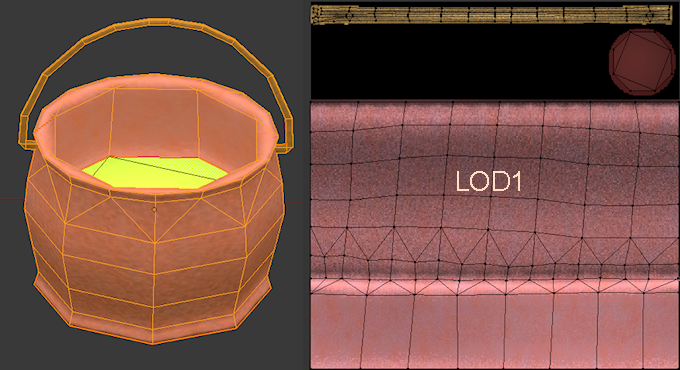 And after baking we are indeed finished with the LOD3 mesh, with the Unwrapping and even woth the texture baking. Now our only remaining task is to create the lower LOD meshes. I first make a copy of the LOD3 mesh, then i reduce edge loops just like i already did when i optimized the LOD3 shape. I reduced the handle from 6 faces to 4 faces around its circumference. 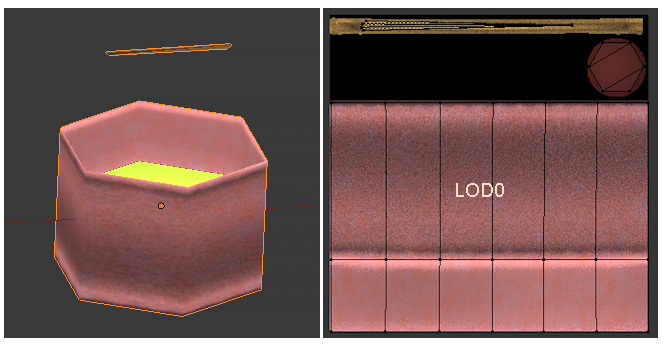 And i removed every secnd vertical edge as marked on the LOD3 kettle (upper part of the picture). I also removed some horizontal edges. The result (seen on lower part of the image) is till very well defined. But we start seeing degradations now. But this does not make much trouble because the LOD2 mesh will only be used when the kettle gets smaller (or further away). But still be carefull. You will want to keep the overall shape as intact as possible again. Now you can see why i have choosen to make the initial UV-map rectangular. It is not too complicated to do this adjustment and keep the kettle look almost identical on both LOD levels. I have again significantly reduced thehandle and the kettle body. But still i have clearly defined the kettle shape. I will change this for the LOD0 mesh. The main reason is that the LOD-0 mesh creates the most resource costs. this is so because the LOD0 mesh is always visible independent on the distance between the camera and the object. So making this mesh very small will result in a better price. But it still is good enough for our purpose. We now have only 21 remaining triangles. Note that this version of the mesh has its interior at the top edge of the kettle. This is not optimal but it saves a pretty lot of triangles. And that is absolutely recommended on LOD0. Any open questions ? Then please feel free to ask. I will be happy to get any response and suggestions for enhancements or pointers to parts which need more explanation.